The Leftist think tank Center for American Progress (CAP) has set up a “war room” in the shadow of the White House and the newly opened D.C. Trump Hotel with one overriding theme when it comes to the Donald Trump presidency – “Resist”. That one word clarion call appears on the home page of the web site of CAP’s advocacy-focused arm. 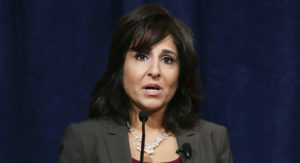 “Our goal is to be the central hub of the Trump resistance, to hold Trump accountable for the promises he made,” said CAP president and CEO Neera Tanden, who was Hillary Clinton’s campaign policy director in her failed 2008 presidential bid. CAP, which billionaire liberal George Soros has poured tons of cash into, also brought on Adam Jentleson, a longtime senior aide to Sen. Harry Reid, to oversee the new war room at the Center for American Progress Action Fund, a 501(c)(4) nonprofit, which intends to oppose Trump’s moves — starting with his Cabinet nominations. CAP is reorganizing after a painful year in which Trump exposed just how deeply the Democratic Party was controlled by what GOP analysts say are out-of-touch coastal elites. “The question of how the think tank would recreate itself in 2017 has been the subject of significant chatter within party circles as of late, particularly given the fact that its 2003 birth was orchestrated by John Podesta, Clinton’s campaign chairman and a former senior aide to both President Bill Clinton and President Barack Obama,” Gabriel Debenedetti wrote for Politico on Dec. 15.